2019 Update: We’ve reviewed the newest options available on the market and have adjusted the article to reflect these changes. You’ll find up to date info and ranking on the best security doors available in this article. The door is both a necessary element of any house, but potentially also its greatest vulnerability. Unless you’ve mastered the art of teleportation or have the ability to phase through solid matter, chances are your home has a door on it. Doors and windows are the two ways through which intruders gain access to your private space and property. Securing windows is relatively easy with grates, shatter-resistant glass or by simply by making them a shape or size through which a human cannot fit. Doors, for this very reason, are the bigger risk, and the point of ingress the majority of burglars will attempt to exploit. Naturally, locking the doors is the first and foremost security measure. But most locks can be picked and your average door can otherwise be forcibly opened with a well placed kick. Doors are what stand between you and the world, basically. Intruders, storms, animals and prying eyes are all denied access by these stout rectangles of material bolted into your wall, making it of paramount importance to ensure that your door isn’t easy to break down and that the lock isn’t easily picked. Security doors generally offer a higher degree of security on all fronts. Hinges are reinforced, the material of the doors are resistant to both the hazards of nature and human attempts to break through, locks are made to be hard to pick, bolts hard to break and frames hard to force apart. To understand how a security door can protect you, you need to understand how a criminal would try to get past its defenses. There is a saying that any lock can be picked. While it’s true that with specialized equipment and an infinite amount of time, no lock is impervious to tampering, it is possible to make your lock impossible to pick for the regular burglar. The basic principle of lockpicking relies on the criminal pushing the locking pins into an open position one by one to open it. Some locks have pins which reset unless under constant pressure (which a key delivers) meaning the criminal would need to keep all of them in place simultaneously. Other locks are simply shaped in a way that lock picking instruments don’t fit in. When the lock cannot be picked, one method – which, granted, is less and less common due to the required tools – is to force the frame apart so that the lock’s bolt is “slipped out” of the receptacle. This requires a special tool (a very powerful vice) to accomplish, and as house building techniques have improved with time it isn’t particularly viable on newer houses – provided they’ve been made by skilled craftsmen and with good materials. Reinforced door frames can prove far too sturdy to even try this on, regardless of the quality of the walls themselves. Of course, hit-and-run burglars typically favor kicking the door in or breaking it down. The laws of physics offer a near-universal weak point on all doors which, when kicked, will blow the door right open. Security doors are designed specifically with reinforcements to this weak point in mind, preventing this overly simple method of breaking in. Since most security doors are solid, non-hollow steel or hardwood, breaking them down is also unreasonably difficult. Naturally, you won’t find many glass security doors, since glass is a major vulnerability. That said, “glass” security doors do exist, but are usually insanely expensive. They are either made from cut and shatter proof security glass, like the kind used for vehicle windshields, or from a transparent material that isn’t glass at all. Buying a security door doesn’t necessarily mean a massive investment, with some models being as cheap as $100, however this is the kind of purchase where quality will definitely cost you. Something you should look out for when buying is to make sure that the door eliminates all traditional vulnerabilities, and it’s particularly important to check whether any reviews state that a user suffered a successful break-in – not just because that’s a bad sign, but because the reviewer will likely state which element of the door failed, and that means information on how to get past that particular model is freely available on the internet! Thickness and material are generally the two most important factors with security doors, but they’re not the be all and end all. A thicker model might still have some shortcomings that place it behind a slightly thinner one. Some security doors are intended as a one-stop solution, being an entire door, while others are add-ons which are attached to the frame of your existing door, and can even potentially be screen doors which allow for ventilation. We’ll be looking at both varieties in this guide. If the previous two products didn’t fit your tastes due to being add-ons and thin mesh screens, this option might be a better choice for you. You want a security door? The L.I.F Steel Security door is a solid slab of commercial grade metal to keep any uninvited guests out where they should be. This door is primarily intended to be installed while the wall around it is still under construction, however it can still be placed after the fact. It is a complete door, not an add-on, so you can’t just pop it in front of an existing port. It is made from galvanneal steel, and in case the drab default gray doesn’t fit the aesthetic direction of your house, can be painted without issue. The door’s combination anchors allow it to be installed in either masonry or drywall constructions, and the lock is picking resistant as well. Unlike the other doors we’ve looked at, this comes with all the hardware needed, like knob, lock, bolt and all. One drawback in the construction is that you can’t switch between outswing and inswing or handing on the same door. There are four models for all four configurations, but once you bought one, you can’t flip the hinges or anything of the sort. Now, technically this is a commercial product intended for use by businesses, however that shouldn’t stop you from making the jump since all that means is that the quality is far higher than most models intended for home use. This door is used by companies to protect their valuables and sensitive property, and that’s the best endorsement it could get. Simply put, this is the most secure door on the list. While it may not be a looker, you can always paint it to improve the aesthetic properties, And when it comes to a security door, looks are secondary at best. With a door like this you can rest easy without having a worry in the world about the impenetrability of your home. L.I.F’s commercial steel security door is a solid and sturdy solution. In terms of security, this is the top, and its plain looks can be easily remedied with a bit of paint. If you truly want security, you’ve found it. 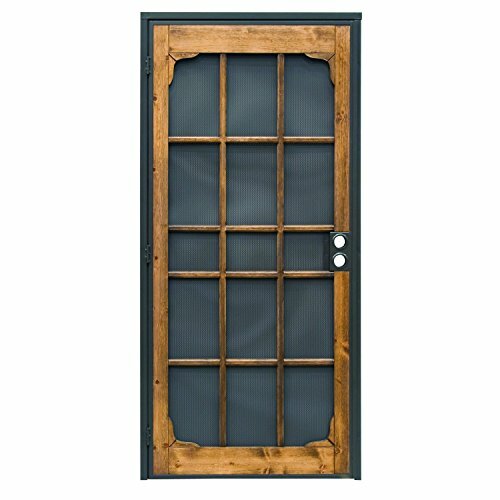 The Solstice model from Unique Home Designs’ lineup is a welcome subversion of the stereotype by which to look good a security door needs to sacrifice functionality. While the Solstice isn’t on-par with the L.I.F steel door in terms of raw security, it beats the other add-on doors both in function and in looks. As mentioned, this is a front mounted add-on door with an intricate steel pattern, the shaping of which is both functional and very good looking. It also comes with a shatter-proof glass inlay, however this can be exchanged for other inlays such as meshes made of various material (though these are sold separately). The Solstice door combines form and function in the most elegant way possible. It adheres to the golden rule of glass security doors – make sure there is no glass near the lock assembly. The design of the door seeks to evoke a stylized abstraction of the sun with rays expanding outwards in a semi-circle, and the disk of the sun itself poised where the lock mechanism is. This way a large sheet of steel covers much of the door’s surface right around the lock, so even if the shatter-proof glass is broken somehow, the would be intruders cannot access the door’s inner workings, and the tight spacing of the steel bars would prevent them from getting a hand in, even. Besides looking absolutely stunning, that one bit of functional design is paired with others. While this is a front-mounted door, it uses special one-directional, one-time use screws which allegedly cannot be removed without causing serious damage to both the wall and the frame. The reason for this is to prevent the door from being easily removed, frame and all, by would be intruders. The aforementioned feature is a major bonus over the other front-mounted security doors which feature regular screws, but still isn’t enough to put the Solstice on par with doors using interior screws. In fact, this is the sole reason why we didn’t pick it as our number one, since overall security is still the most important factor, and one clever bit of engineering isn’t enough to balance out being front-mounted. The door comes with a set of brass hardware, so you won’t need to buy that separately, and its handing can be reversed at will. The Solstice was so close to nabbing our top pick spot, but being front mounted is too much of a default, inherent security concern to let slide. If only it was a Z-bar frame, or internally mounted. Nonetheless, if you live in a neighborhood where absolute maximum security isn’t warranted then maybe, just maybe, grab this one. Grisham’s Tuscany model from the 555 series puts a lot of emphasis on weather proofing and storm protection, meaning this may be a specialised model suitable for people who want to combine the function of a storm door with that of a security door, without losing their privacy as they would with a full-view variant of the former. This is an add-on door with an outer steel frame and shaping on the front, with a shatter-proof glass inlay behind the steel. Grisham’s designers went the extra mile to weatherproof this door. The Z-bar frame by default offers greater storm protection than front-mounted doors would, but in addition this door has contoured felt lining for further insulation and sound damping. Plus, the glass inlays have rubber borders to achieve the same effect. The package includes mesh inlays which can be changed with relative ease, in case you want to trade the glass for something that allows for ventilation. The hinges are concealed to prevent tampering, and being a Z-bar frame, at least some of the screws are internal and hidden, making it impossible to uninstall the door without unlocking it. The steel outer frame has a fairly reserved yet elegant design, meaning it will fit most houses without being an eyesore, or being a blatantly obvious security door. The design, however, carries with it a massive flaw, which knocked this door lower on our list than we’d like – there is plenty of exposed glass right next to the lock housing, which is the main issue any glass security door can have. The Tuscany and the Solstice were hard competitors to judge, but with the Tuscany failing to adhere to the number one rule of all glass security doors, we had to bump it down. 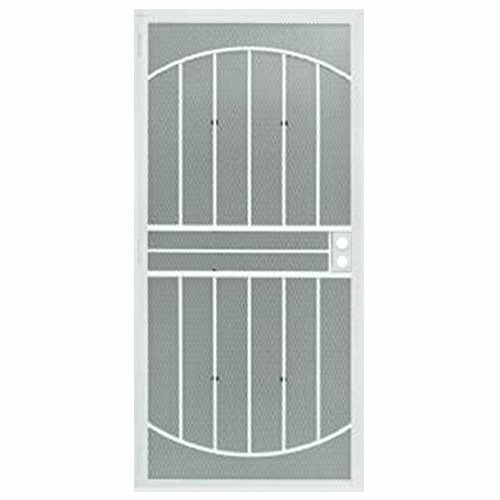 That said, this is still a great add-on security door which people living in areas with notoriously rough weather might want to check out nonetheless. Unique Home Designs’ Estate model offers many of the same features with some improvements as the Woodguard at a better price. 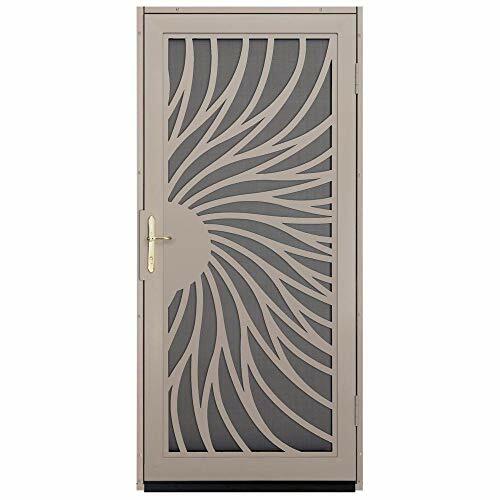 This is also an add-on door with a partial steel mesh, however that’s complemented by a tempered glass inlay as well, which is a nice surprise on a door at this price range. Featuring a more elaborate design, the Estate shows that you can get extra security without sacrificing looks. The door is separated into three sections, with two large square areas and a narrow rectangular area in the midsection. All have matching mesh and glass inlays, allowing you to customize your door to your preference, mixing and matching whether you want all glass, all mesh or a mixture. While likely not its most important, the switchable inlays are likely the Estate’s most eye-catching feature. The mesh modules are made of steel and double as an insect net while obscuring visibility from outside. Meanwhile the glass inlays give the door a nice shine. Generally speaking, looks aren’t what matters most when it comes to a security door, but many buyers will end up picking based on them anyway. The Estate one-ups the Woodguard in terms of security by having interior frame screws, meaning the door cannot actually be uninstalled unless it’s open, so you won’t need to fear resourceful burglars simply unscrewing the entire assembly to get past it. The door can be flipped for both left and right handing installation and uses a Z-bar frame. This adds an extra measure of sturdiness and prevents the frame from being forced open. The package comes with a hydraulic door-closer, however this has been a commonly criticized element and many suggest buying and installing a third party closer from the get-go since the included one typically fails within a month. Unique Home Design’s Estate security door offers an affordable and effective solution to users who are looking for an add-on security door to complement their existing front door. While this still isn’t the most secure option due to it being a mesh add-on, it’s one of the best choices in its class. The Prime-Line Woodguard is an add-on security screen door with a steel frame and mesh adorned with wooden elements, designed to be applied on top of an existing front door. The door uses a perforated steel mesh which is sturdy but still allows for air to move if the inner door is kept open, and the holes are small enough to keep insects out. The wooden elements on the outside certainly make this door easier on the eyes than a sheet of plain steel and fit in well with many styles. The main draw for the Woodguard is that you won’t need to replace the entire door with it, just add it on to the exterior of your current door. It adds the sense of safety provided by security doors, and the density of the mesh means that in hot summer days you can keep the other door open to let the air move whilst not having to worry about insects getting through or people seeing in. The door swings on three tempered tamper-proof hinges which aren’t hand-restricted, meaning flipping the door will let you install it in either orientation. The frame is welded steel and quite snug so as not to allow tools to be forced into any gaps. While the frame itself isn’t too thick and lacking the structure of the house itself around it, you’d think it is susceptible to be forced open, however it doesn’t crop out and is in line with the door itself, providing no leverage to do this at all. Installing the door is pretty easy, with screws included. You just need to drill holes in the right spots, screw the frame in place and done. While simple installation is usually a good thing, the issue in this case is that taking it off is just as easy. So long as the would be intruders simply unscrew the thing, they might as well steal the door itself too. That said, the screws are deep-set and if you tighten them with a power screwdriver, they’ll need one to do it too. Naturally, as this is an add-on screen door, it’s a lot thinner than most dedicated security doors, and a mesh is by default less sturdy than a solid plate. If you pick this door, you’re doing so because you know you don’t actually need a proper security door, however customers looking for maximum security won’t be happy with this model. The Prime-Line Woodguard is what we’d call a security door designed for people who don’t need a security door. Granted, it will keep out all but dedicated burglars pretty well, however it still has some security shortcomings and obviously traded some functionality for looks. STEEL SECURITY DOOR - This Woodguard Steel Security door is strong and durable, featuring 24-gauge perforated steel mesh, a 1-in x 1-in welded steel frame & 3 heavy duty tamper proof hinges. EASY INSTALLATION - Installation is quick and easy. The how-to video on this page covers what tools are needed. 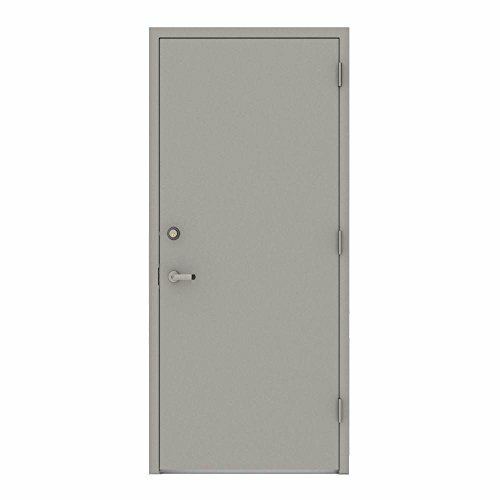 INCLUDES - This steel security door includes a 3-piece 1-1/4-in outside mount frame for easy installation. Matching one-way security screws are included. We’ve mostly looked at add-on doors here today, which is also a reflection of much of the market. You’ll find few fully solid steel security doors available to the private customer which can be installed after construction, and most of these are sold in bulk to companies. Nonetheless, add-on doors are still a fantastic solution (provided they avoid some of the pitfalls we’ve mentioned) and can be as effective as solid doors when it comes to keeping out intruders. Most would-be burglars don’t run around with the kind of hardware needed to cut through even the thin steel mesh of a screen security door, so as long as it meets some criteria, one of those will dissuade criminals as much as a solid slab of steel would.